AEG Reveals New Details for J.W. Marriott Expansion. High-Rises Proposed for South Park, City West. The plans were shared at a Tuesday, March 15, meeting of the Downtown Los Angeles Neighborhood Council's Planning and Land Use Committee. It wasn't the only big project to get a public airing, as other developers revealed plans for a 24-story tower on Grand Avenue and a project that would bring more than 400 residential units and 126 hotel rooms to City West. AEG's hotel expansion comes amid a South Park boom that includes several hotels. The company's first hotel play came in 2010, when it opened the tower with 878 J.W. Marriott rooms and 123 Ritz-Carlton rooms. The new project would create a 38-story tower with 755 rooms at the northeast corner of Olympic Boulevard and Georgia Street. The project is currently in the entitlements phase, and Michael Roth, a spokesman for AEG, said the goal is to break ground early in 2017 and open the addition in 2019. "We've had incredible occupancy rates since the hotel opened. 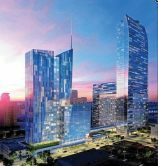 With the upcoming conventions slated for Los Angeles and other meetings coming to the hotel, we thought it justifies the expansion," Roth said in an interview with Los Angeles Downtown News. "We felt this was the number of rooms that the J.W. Marriott can best support." The Downtown office of architecture firm Gensler is designing the project. New renderings show the tower with a slanted rooftop, taking advantage of new design rules that don't require helipads on high-rises (the upcoming Wilshire Grand replacement tower will be the first building to feature a sloped roof). The expansion would feature the same steel and glass exterior as the existing hotel. Plans call for including digital signage on the building. The tower would also feature amenities such as a fitness center and rooftop pool. The project would also include a new conference center with ballrooms and meeting space on top of L.A. Live's western parking garage, replacing what is now known as the "Event Deck." The 170,000-square-foot building would be two stories and serve as an extension of the hotel's existing conference space. The new hotel tower would be connected to the existing J.W. Marriott by a sky bridge above Olympic Boulevard and would not require its own lobby. Instead, guests would check in at the current building. The plans also feature other sky bridges that would connect the J.W. Marriott and the new conference space with the building housing L.A. Live's Regal Cinemas. The DLANC meeting also offered new details about a project from City Century LLC, the U.S. subsidiary of the Shanghai, China-based Shenglong Group. The 24-story building at 1233 S. Grand Ave. is tentatively called the Grand Residences, and would be City Century's first development in Downtown. Steinberg Architects is designing the project that would create 161 apartments, with 15 studios, 93 one-bedroom, 47 two-bedroom and six three-bedroom residences. The project would rise on a fairly small lot, just 18,000 square feet. It would include 215 parking spaces. The building would have an unusual slightly hexagonal shape. Stuart Morkun, executive vice president of development for City Century, said the developer intends to move away from the "classic" and common rectangular layout. The hexagonal approach, he said, also will allow the building to take advantage of the changing light throughout the day in Downtown. One unique element in Grand Residences would be a pair of two-story townhouses with entrances on the sixth-floor podium level. They are intended in part to cover the fourth level of above-grade parking in the building. Morkun said City Century hopes they and some of the other large units will help lure families to the project. "We believe we have a larger average unit size than most apartments in the area, at 963 square feet," Morkun said. There would also be an amenities deck on the 23rd floor, with a kitchen and communal space for residents. Simon Ha, a principal with Steinberg Architects (and a DLANC board member; he recused himself from the presentation) said after the meeting that City Century expects to break ground in the third quarter of this year. No budget was revealed. Another large new project has been proposed for City West. A pair of buildings at 675 S. Bixel St. and 1111 W. Seventh St. would replace a parking lot and a vacant building with a residential tower and a seven-story, extended-stay hotel. A project representative would not confirm reports that the hotel, at 1111 W. Seventh St., may be operated by Home2 Suites, a Hilton subsidiary that operates extended-stay hotels. The seven-story building would feature 126 guest rooms, along with a pool deck on the second floor. A 36-story residential tower on Bixel Street would have 422 apartments. It would include a 39,000-square-foot podium deck with a pool, dog park and other amenities, and there would be 5,600 square feet of ground-floor retail. Project architect Daniel Gehman said 212 trees would be planted. Other amenities include multiple lounges and screening rooms, along with a fitness center. Overall there would be 596 parking spaces, with hotel spots in an underground garage. The entire project features wide sidewalks along Bixel and Seventh streets. The residential tower would have a grid pattern along the sides. That extends to the roof, providing a "basket weave" like canopy to the roof deck. No timeline or budget have been announced.